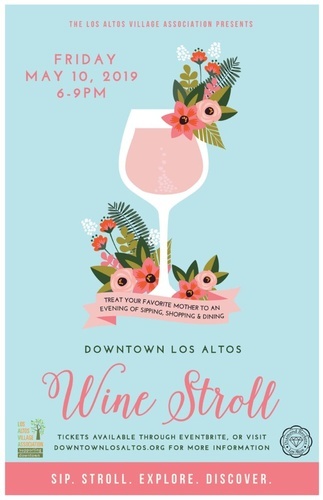 Join the merchants of Downtown Los Altos for an evening of tasting great wine and strolling at the Downtown Los Altos Wine Stroll, Friday, May 10, 2019 from 6 – 9 pm. Advance tickets are $35 each (plus applicable taxes and Eventbrite fees). If you are purchasing 10 or more advance tickets for a group then tickets are $30 each (plus applicable taxes and Eventbrite fees). If there are any tickets still available the day of the event they will be $40 (plus applicable taxes and Eventbrite fees). 2) At Diamond Brokers of Los Altos, 333 First Street. PLEASE NOTE: This is also a tasting site. Join us for an evening of tasting great wine at the Downtown Los Altos Wine Stroll on Friday, May 10, 2019 from 6 - 9 pm. Advance tickets are $35 each (plus Eventbrite fees). If you are purchasing 10 or more advance tickets for a group then tickets are $30 each (plus Eventbrite fees). If there are any tickets still available the day of the event they will be $40 (plus Eventbrite fees).